Jeane Westin's previous release of The Virgin's Daughters: In The Court of Elizabeth I received much attention when it released last year. 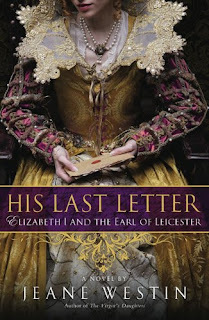 I have not gotten a chance to read that novel, though I did not want to miss this new release as it goes into the much discussed relationship of Elizabeth I and a favored courtier, Robert Dudley, the Earl of Leicester. An undisputed fact is that Robert Dudley and Elizabeth had spent time together in their early years, and they maintained this friendship till his death. What is at the crux of the debate is whether anything sexual occurred during the relationship. There have been many speculations as to the nature of their relationship, and even rumors that Dudley had fathered a secret child with her. I was very curious to see where Westin would take us in this fictional telling of this fascinating courtship of a supposed Virgin Queen and a supposed lover. (I am one of those of the belief that Elizabeth was indeed a virgin, who flirted, perhaps outrageously, to garner attention and admiration). The beginning of the novel features a small author's note that advises to follow along the timeline using the chapter guide. I quickly learned why this was pointed out when I discovered that the story goes back and forth between Elizabeth's younger years, her middle years, but had started when Dudley had died. Elizabeth clutches the last letter she received from Dudley and the story takes off. The entirety of the novel is not a typical Elizabethan read, as this does not focus on the events that occurred around Elizabeth during her long reign. The author focuses primarily on Elizabeth and Dudley, tapping into their minds and thoughts as she attempts to recreate the relationship between the two. Westin takes liberties with her story, and those die-hard Elizabeth I fans may take offense to that. The other downside to the novel is the hopscotch across the timeline, as I could never fully grasp where they were and what was going on unless I specifically worked out the chronology in my head using the date that is provided at the beginning of each chapter. And some chapters would end with either Elizabeth or Dudley reminiscing back to a specific event in order to lead into next chapter, which would of course be another time and place. Westin keeps her novel focused on the objective of spotlighting the romance between Elizabaeth and Dudley, yet she also takes time to cultivate the story behind the effects of the threat of the Spanish Armada and a little on the Mary Queen of Scots ordeal. Since the rest of the actual historic events took place as a behind the scenes nuance during the novel, newbies to the Elizabethan era may not appreciate or grasp the flow of the novel as much. And since Westin does not go in to the details of these smaller events, it is sometimes forced into inane conversations like the lady's maid Anne telling Elizabeth what to call Lord Burghley since he used to be Cecil but was now made Lord. That whole conversation, and others, were among those that really would have been better off not happening at all as it simply took away from the novel and seemed ridiculous in the narrative. I think those middle-ground Elizabethan fans who have not yet felt that they have had their fill of Elizabeth I novels would enjoy the story for the entirely different point of view that it offers. Both Dudley and Elizabeth are portrayed as completely and totally head over heels in love with each other, forsaking all others, yet unable to tie the knot due to politics. Although Dudley was married at least twice and had multiple affairs, Elizabeth still adored him, albeit in a jealous manner as she banished Dudley's second wife from court. Those Elizabethan fans who have read every other Elizabethan novel might want to skip this one though, due to the confusing nature of the alternating timeline and the singular focus on the love match between the two which may seem to scream of jealous tirades from Elizabeth and Dudley as a spineless jilted lover. Jeane Westin has a love for all things Tudor, and she graced The Burton Review recently with this interview (giveaway as well). She states that her love for historical fiction stems from the fact that known history is full of gaps and questions. She loves being able to pen a novel in her favorite genres to help to re-imagine a different perspective and to perhaps fill in some of those gaps. Westin has done that here with the love story of Elizabeth I and Robert Dudley by presenting these two in a way that is daring and provocative that demonstrates Westin's love for the Elizabethan period. The Tudor Mania Challenge which is here at The Burton Review ends this Saturday night. This will be my last entry into the linkfest of the reviews.I can't wait to see who the winner is of the Challenge, who gets a book of their choice from The Book Depository!